Since its inception Montecristo Travels has been blessed with a small and fiercely loyal following. These generous spirits, kind hearts and exceptional individuals are the reason for the humble success we experience after only 18 months of web presence. They are also the reason we have had some positive impact on our community with our fundraising and philanthropic endeavors. These fans – if I dare use the term – are our ambassadors. 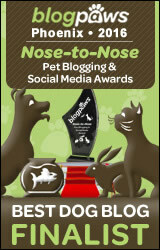 They spread the word on dog travel, sharing our posts on facebook and even tweet on our behalf. Their honest and heartfelt enthusiasm pushes the Montecristo Travels team to do more – to be more. So, when the opportunity presented itself to meet not just one but a dozen of our facebook friends in person we simply could not say no. We would find a way to cross the miles and finally turn a two dimensional online relationship into a real, tangible – with hugs and kisses – 3D experience. Oh the joy to hear their voices, see how our friends move, listen to their accents and take in their stories coming forth from their own lips! To sniff a hand … oh the thrill! In addition I would finally get to go to a glamorous event worthy of my finest attire. The anticipation was almost more than I could manage and then I found out I was nominated for not one but two awards … well … I almost fainted. This is how it came to pass that my bag was packed, and on May 17th 2012 I boarded a plane at the Ottawa airport and flew across the USA to Miami, Florida in order to attend and participate in the Kiki Hamann 2012 Summer Collection Runway Extravaganza! A fashion show perfectly called (as if just for me!) “Destinations”. A collection inspired by dogs like myself; the trendy, social, travelling the world canine that attends events and is a fully integrated family member. My first "steps" on the runway with Kirsten! Mom and I were picked up at the airport by Alex (Kiki’s life and business partner) and what a welcome hug we got! Alex looks all tough on the outside – and he can be – but you should watch him melt at the sight of me! Mom assures me that there is something absolutely adorable in a grown, massive, dangerous looking man using a baby voice to talk to a 3-pound Chihuahua. Alex explained that we had a little over an hour before another guest also staying at Maison Kiki Hamann arrived at the airport. So instead of leaving right away, we were taken for a nighttime drive downtown Miami where I got to sniff the ocean air, listen to the music and people watch! We sat down for some amazing sushi and as I nibbled on some specially “made for me” chicken … I knew … this trip was going to be very different. Hopping back in the car we returned to the airport. I looked out the window and finally I spotted dearest Valentina. For those of you that do not know, she has the loveliest Dog Bakery named “Little Paris Noel” after her fashion model fur kid by the same name. Oh what fun to finally meet them in the flesh! Paris introduced me to her “Aunty Dana” also travelling with them and without further delay Alex whisked us off to the Maison where Kiki awaited impatiently for all of us to arrive! Mom and I barely made it out of the car door when we were greeted with open arms, a long a quiet embrace as warm as the Florida air and kisses. Meeting Kiki was like meeting a long lost and well-loved family member. Instantly we connected. A massive Great Dane startled me as he came to join in the group hug knocking mom off her feet. Laughing we all walked inside the Maison and I heard from Kiki of Titan’s (the Dane) roadside rescue while Alex made a delicious dish of buffalo mozzarella, basil and ripe tomatoes. Champagne was poured and friendships toasted. We got a quick tour of the Maison and property, settled into our rooms, and got to see the workshop where Kiki works her magic. The next three days went by in frenzied chaos that was constantly punctured by wonderful beverages and food – we ate … and ate … and ate. The day before the event the rain was still coming down. I was told over and over how this was most unusual for Miami and the Redlands. Yet, it wasn’t just pouring rain – it was pouring friends! Joining us as guests of the Maison was little Sophia, the cutest white Pomeranian you will ever meet and her lovely, graceful and generous mom Gena. There were the “twins” (as I called them) – two wonderful Cavalier Spaniel diva’s named Penny Lane and Lilly Pad who had been the first to arrive with their mom Rose. I also had the pleasure of meeting the first of all Kiki Hamann dogs, Miu Miu, who has the same temperament as myself; calm and serene. There were the crazy Yorkies Brit and London, and so many others … with guest dogs I believe there might well have been 20 canines running around! We chatted, got to know each other on a most personal level and the humans sipped Champagne. We sniffed each other, barked on occasion, shared stories about our past, talked about our dreams for the future and got excited about the event. We stayed up well into the night, with Kiki occasionally coming up for air from her workshop where she was pulling together last minute marvels. We all went to bed – praying the rain would let up. The day of the event we were teased by sunshine but by mid afternoon the dark clouds had returned. We kept on chanting “Rain rain go away please come back some other day”. No one wanted to listen or believe Mother Nature’s threat of showers and the set-up continued. We all remained optimistic. It would not rain that night! The runway was set, the food prepared, the models arrived and items for both humans and canines were sorted out. We watched in amazement the colossal amount of work that went on. The banners were attached, the flowers were laid out, the dog bar was set up and Valentina’s cookies from her bakery looked as good as they tasted on display in the entrance! Media and photographers arrived … dogs were washed, groomed and matched up to models. Around 4:00 pm the make-up and hair artists started working on Mom and the other human guests that were staying on location for the event. The 1940’s dress and fascinator mom had purchased for the occasion worked out really well and she looked as glamorous as I felt. Accepting the Dog of Hamann Award 2012! It was an all-white attire event at Maison Kiki Hamann; the bright red carpet the only massive splash of color in a sea of white. Prince Moet finally arrived, wearing his crystal crown and carried in his bag by his Mom Skipper. Diva and Maltese extraordinaire Stella made her entrance quietly but with grace with her Mom Jessica and Aunt Cher. These fellow Canadians had flown in from Calgary! The moment I thought would never arrive was finally there. It was time for me to have my runway debut! Mom was nervous. I could sense it. The chaos back stage frightened her. With my tiny size she had visions of accidents dancing in her head. But then this lovely, calm and beautiful model named Kirsten said “I would be honored if you would allow me to be the one to walk your dog down the runway”. Mom nodded and handed me over. “Stay with me while he gets use to me” she said reassuring mom further. Together we watched the insanity… me – from the island of calm that was my new friends arms…and so … mom left me in good hands and went to take her place in the audience. She walked to her seat with Gena, both chatting away excitedly at the thrill of it all and sat waiting for the show to start. The DJ had the music playing, the smoke machine started making the entrance look very intense, the lights flashed and the models were about to begin on the runway when … the skies opened and rain came down – hard. Everyone rushed to the house where we lined the red carpet and – with the will and abilities of the professionals in charge (we love you Yris!) – The show went on!! So it is dear reader that I had my first runway model experience, inside the home of Celebrity Canine Fashion Designer Kiki Hamann! It would be foolish to believe that something as silly as rain could put a damper on the success of the event. The show was a huge hit. All the models (both human and canine) strutted their stuff, the music was fantastic, food delicious and the room was filled with smiles and positive energy. Kiki taking in all the love! Originally, all guests were to sit properly in rows just like at the opera or movies. But with the sudden move indoors and now limited space everyone had to stand closely to one another along the edge of the red carpet in the long hallway. Ironically, instead of this being a draw back – many found it to be a benefit. Being so close to the makeshift runway afforded everyone a closer look at the gorgeous, one of a kind, hand made bags, dog slings, harnesses, dresses and leashes parading up and down. People that would never have talked to each other in a more “fancy” set-up started chatting. A buzz of conversation filled the room and new friendships were being made left right and center. We all now had something in common … our dogs… and the rain! What an icebreaker the poor weather turned out to be. So in this bubble of joy under the pitter-patter of raindrops, as if under one huge collective umbrella – the fashion show ended to great applause and Kiki finally came out to take her bow and receive the well deserved accolades and of course pose for millions of photos. Everyone wanted a piece of her. What no one knew was that I had the pleasure of her lap for hours! That’s right! When a model was not holding me on the runway …I had been sitting with Kiki luxuriating in the fine vibe of a real dog lover. At last – the Oscar-style ceremony for the Dog of Hamann Awards began with five categories …humanitarian, beauty, achievement, lifestyle and … The Dog of Hamann that embodies all four. I had been nominated for beauty and lifestyle. The carefully guarded secret of the evening was who among the nominees would be chosen as The Dog of Hamann 2012. With the intimacy of the fashion show, people in the audience had now come to know us nominees far better and in depth. So when winners were announced it was with real tears of happiness, shouts of congratulations and applause from a sincere audience that awards, hugs and kisses were given and accepted. Mom and me at the event! We cheered for all who won – and when the two categories I had been nominated for had other winners – I was genuinely thrilled for them! Sophia won the beauty award and Millie La Rue (who had been unable to attend) the Lifestyle award. I thought to myself, that it was right and good and that maybe – perhaps the next year – my turn would come. So, my ears perked up when … Kiki started talking of the Dog of Hamann – the final award. She had said something that made me almost dare to think… had she said “he”? Had I heard that correctly? … A boy was going to win? That could only mean …ME! I was moved … and Mom to tears…when we won The Dog of Hamann 2012 award. We cannot tell you how honored we were and still are. Words fail us utterly in expressing the sea of emotions that the moment created and the warm glow in our hearts that still lingers today. Grinning ear-to-ear Mom and I enjoyed the rest of the evening. We met other facebook friends including Isabella Rose and her mom Debbie who is as lovely in person as I thought she would be. After more food, champagne and dancing the event died down – slowly and reluctantly people made there way home or to their hotel rooms. We waved goodbye, talked a little longer not wanting to let the magic of the evening end just yet and then…exhausted we all somehow found our way to our cozy beds. The following 48 hours saw the departure of those friends that had also been staying at the Maison. For mom and me, our vacation had just begun and we stayed on for one last day – a day of one-on-one with Kiki and Alex – our treat (as we see it) for winning the Dog of Hamann Award. Dad finally joined us and as we said au revoire and not adieux to Kiki and Alex (and all the dogs), I realized that what had united us was not the fashion (as exquisite as it was), nor the food (as delicious as it had been), nor even a desire to travel. What had brought us together was a connection we all share for a lifestyle… for dogs. The connection found in people of similar thread. That connection my dear reader is what made the event so great, it is the same one that connects us all …and it has a name. Love. Whenever friends, food, fellowship, and fiesta converge, there is magic in the air. Love is usually the by-product and it seems there was an abundance of love for those few days. Your community is truly special, Monte. It is Brad! Now we need to get you a dog so you can join in the crazy fun!!! Heck – just come as my guest one of these days! HUGS! New fans!! now that is what we love to hear! thanks for taking the time to comment. Yes, the way you describe it … that was it! Insane! yet at the same time still relaxing. Gator bites and don’t forget frog legs!! LOL!! Hope to meet Desi in “person” some day soon!!! We are glad to have met you! Fabulous Monte!!! It’s like you’re living a fairy “tail” story! You are one lucky pup! I’m at lost for words, just beautiful, loved it, I’ll leave it at that. Maybe next time you will join me?!!! How much fun would that be?!! In the meantime we have our own pool party to set up!! Hugs!! Sonja, this was so beautifully written, it moved me to tears when I got to the Pray. It’s been such an emotional week! I really appreciate your gentle humor. Your words enabled me to feel the joy, anticipation and unconditional love experienced by all at the event. Congratulations Monte! Congratulations to your parents and to Kiki too! How I wish we could have been there to experience this LOVE-FEST! Perhaps next time! I hope that your difficult week has come to an end and that positive energy will continue to follow you. If our words – as humble as they are – made you smile when you are down then we have done what we set out to do! It was an amazing experience … not one soon forgotten. Excellent event, Great friends, Magnificent Ms.Kiki and her works of art and Much, Much love! I’ve enjoyed so much reading your chronicle of the event…it was like I was there (and how I wished). It would be many next times,because all this is based in elegance and much love. Eventually we will get to meet :like MiuMiu I too have fallen in love with you. Kisses to your Mommy and to you a hug and a nose kiss. I am honoured beyond words at your visit and comment …. I hope we do meet someday it would be an amazing moment for certain. Perhaps Kiki will allow us to tag along on a visit – we do love to travel! I took a photo of a white hibiscus for you … I’ll send it to Kiki to send to you! She told me they are your favourite. Thank you … and lots of love sent your way. So well written! You just allowed us to re-live the great time we had! We are so glad to meet you guys and look forward to seeing you again! Do come to visit us and Calgary Stampede! Thanks Jessica – was hard to write! With SO much going on how do you choose what to mention and what to leave behind as “too much”?? Glad I was successful in capturing the moments! We ARE thinking about it!!! (stampede!) It will depend on our ability to take time off work (the bipeds that is). Keep you posted! Wait for the video!! LOL!! Oh Skipper it was a huge honour and pleasure to meet you!! You are an amazing person with such a positive energy about you. Loved hanging out with you! See you soon!! And tell Moet I have his back any time! now how can I see what I am typing when tears keep on blurring my sight and getting in the way… Your writing is brilliant and heart felt. Thank you dear, for this amazing re-telling of the story we all shared that week. As I understand, life is the art of encounters…. and we had ours just the way it was lined up to be! As you know for the most part I was tucked into my personal cave, the Kiki cave, getting last minute pieces done. So, you have just lent me your eyes so I could attend my own party! We must do it again SOON! Hmmmmm….. my creative mind is at it again! Monte… you are so very loved! Oh Kiki … how we miss you. We must do it again soon … just give us time to save up! LMAO!! I believe you are correct and that life is indeed the art of encounters. It is people that make travel so special. Certainly we travel for art, culinary experiences, architecture and history … but at the centre of every successful travel experience … are the hearts and souls of the people we meet. We shall never forget that first embrace. See you soon my dear friend!! Next time … The Monkey Cage!!! 😉 LMAO!!! Wow! We loved every passionate, loving and heartfelt word used to describe your extraordinary adventure!! We cried tears, chuckled and excitedly read it so fast, we went back to re-read, slowly taking it all in, smiling at the small similarities of our memories! We agree….the all around love felt that night was so amazing and not to be forgotten..ever! Meeting both of you was so highly anticipated and you were both wonderful..as we knew you would be! Thank you for sharing your lovely thoughts and photos! Congratulations again Monte….you ARE a True DOG OF HAMANN!!! You two ladies are so warm and lovely! I only regret not having more time with you! we must must find a way to have a one-on-one experience! let us make that happen yes? Isabella Rose you were magnificent that evening in your Kiki dress. It was an honour to pose for photos with you and with your Mom. I am thrilled it happened and that we connected. You were equally elegant, and Kiki and Alex are the most phenomenal, loving friends…. opening their arms and their magnificent home to us. They truly rolled out the red carpet and made this event very personal and intimate. I do believe the flirting was mutual. Who would not love Sophia!? and I know Mom is smitten with you. She keeps tellign dad we MUST go deep sea fishing … so perhaps that will be the next wild adventure!! Love you both … our Oddo Ladies. Your grace and charm is always a pleasure to behold. Lisa – I KNOW you and I will meet one day – somehow I know it in my little heart. IT WILL happen! Thank you for stoping in and I am glad you enjoyed our account of the event! It was something we shall never forget. I have passed the message on! Thank you Aunty Izy!! now that your boy is going to be in the “biz” he and I can chill out sometime and exchange notes! It was an amazing experience … I found it all to be much like theatre in terms of backstage chaos … only … worse! I love your blog ,but that you know already , I love the way you do have a way with telling a story and documenting it on photo, I particularly like ,the feel I get from this event is that everyone was very relaxed and Kiki makes all peoples and fur persons feel at home ,we so would love to been able to see that up close, so we are happy to kinda be there with you. Frankly I am delighted for your Dog of Hamman achievement you do deserve and yes you totally are the dog jet setter Metro chic kind hearted well opinionated adorable and utter UBER cute! We live a country simple life and we love reading this so ever so chic fabulous adventures of you. We notice one thing though all the doggies were lovely but we fell in love with Brit she is so adorable!! love the photo of the two of you! Thank you for the kind words and your lovely invitation to visit your country. Ireland is on the list! so hopefully we will make that happen some day soon. SO much world to see and so little time. *sigh* When we travel we tend to rent apartments it makes life easier than hotel stays. We also have the good fortune of friends all over the globe. From time to time we have stayed at hotels and so far it has been all good experiences. For ireland – we might do what the bipeds did for Scotland many years ago – and rent a car and stay in bed and breakfasts. I will certainly let you know if we come! promise. IRE: the apartment idea is a yes deffo,B&B not so much a good idea. top of the site you see an orange square …. click it!